The next time you reach to charge your personal devices, you may be harnessing the power of the sun. 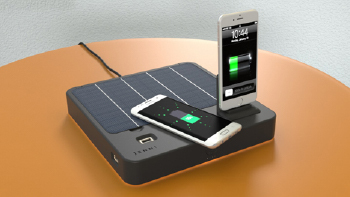 Better Current, a company working to deliver energy storage products to elevate people to the next level of energy management and sustainability, has created the JENNi: a compact and expandable home-use solar power charging station that aims to charge consumer electronics while at home or while on the move. After the design review and optimization phase, the project focused on validating the annual usage pattern for the JENNi in a Toronto Summer test scenario. During the testing, George Brown College provided Better Current with performance data for each major component and the integrated system, as well as recommendations for improving the overall prototype design. Students experienced design and evaluation phases from the startup company’s perspective and had the opportunity to provide direct input to this real world setting. Following the project Better Current later hired these students for additional support. Two fully-functioning prototypes destined for investor presentation were created by the project team after revision and assembly. Following their time with George Brown College, Better Current was able to use the prototype to successfully secure additional financial support and expand their outreach through demonstrations with the public.